Dates have been announced for this year’s annual festival. The Montserrat Arts Council (MAC) says the official dates for the festival are December 23, 2016 to January 2, 2017. The dates were shortened to allow for visitors to experience the premium events within ten days. Prior to the official opening, there will be other private events, including the MAC Art Exhibition which opens on December 5, the Sir Howard Fergus Scholarship Fund Dinner on the 17th, and the St. John’s Action Group Princess Show on the 18th. 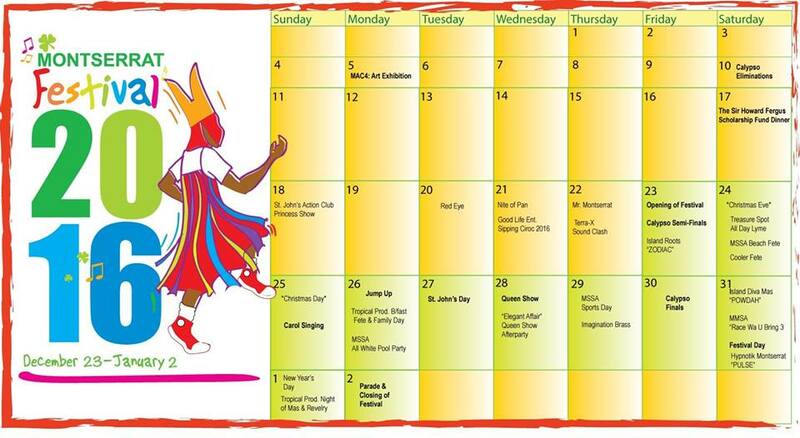 The official festival calendar events include Calypso Finals, Miss Montserrat Queen Show, Festival Day and Parade Day. This year, the annual parade will be on January 2 as New Year’s falls on a Sunday. Singers are encouraged to enter the calypso competition which closes on October 14th. The council is also seeking volunteers to assist the various committees as well as participants to host the festival shows.